Melted popcorn decorations. I remember these quirky decorations being hung in classrooms when I was growing up. They were also displayed in storefronts and many people hung them on their front doors and in bay windows. Little did I realize these cool decorations were being manufactured right in my own backyard. They were manufactured by the Kage Company of Manchester, CT. I grew up in the next town over. The very popular, kitschy Christmas decorations referred to as “melted popcorn” were actually named “Glitter Plaques” by their creator, Kage Company of Manchester, CT.
Popularly referred to as “melted popcorn” because well, that’s what they look like, these kitschy decorations were really made of polyethylene. The Kage Company was founded by Hyman Gerstein in Manchester, Connecticut in the 1930s and began by making wooden clothes pins and doll furniture. With the advent of electric clothes dryers and plastic doll furniture made more cheaply overseas, Kage turned to manufacturing plastic envelopes like the type that IDs were placed in. Current president William Hayes related the story of the decorations’ origins. Gerstein’s daughter, coming upon a box of colorful plastic chips left for her father by a salesman, assembled the colorful pieces into the shape of a small chicken. Her father placed her creation on a cookie sheet and baked it. He liked it enough to take it into W.T. Grant Co. execs in NYC who promptly ordered 25,000 of them. Over 200 different designs were made and over 80 million Glitter Plaques were produced. The Kage company was purchased in 2007 by William Hayes who had worked his way up from a new hire in 1969 to became company president in 1985. According to Mr. Hayes, these decorations were officially called Glitter Plaques. 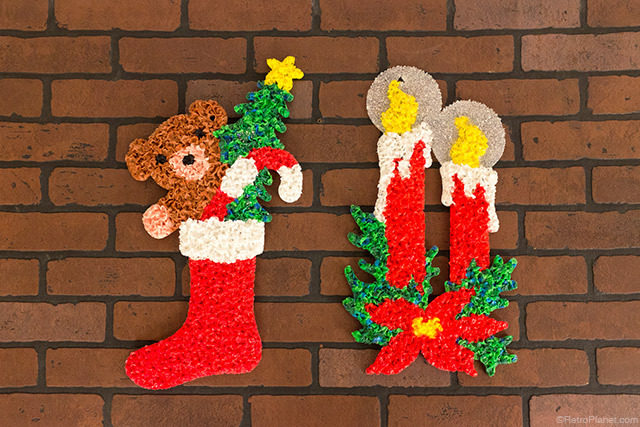 Although the melted popcorn decorations (or Glitter Plaques) are no longer manufactured by Kage, the company is still operating in the original building under its new name, Kage Poly Products. These were very popular decorations from the 60s through mid-70s but were still being made as recently as 2008. Glitter Plaques were made for just over 50 years, and according to Mr. Hayes, over 80 million of them were manufactured. 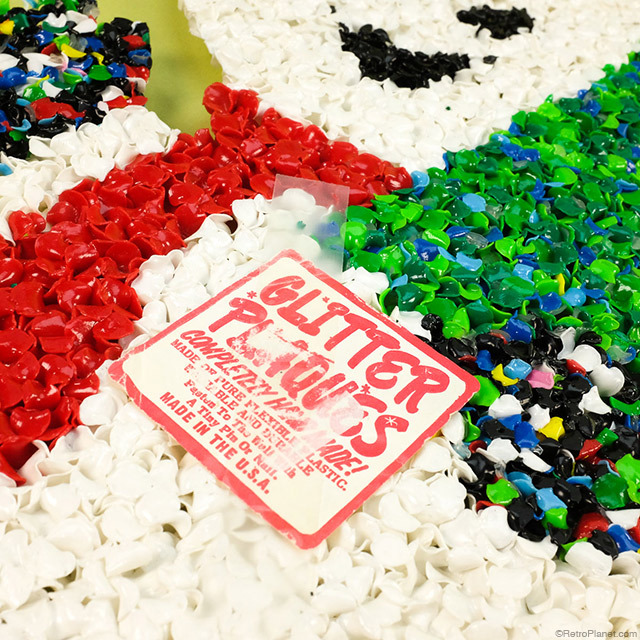 Melted popcorn Glitter Plaques were manufactured for over 50 years and as recently as 2008. 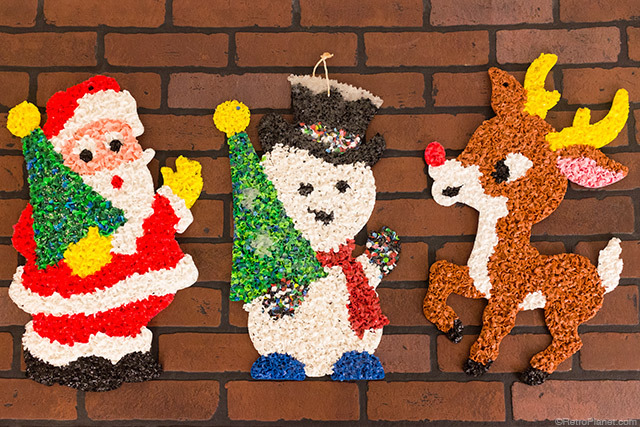 Colorful melted popcorn decorations were made for Christmas, Halloween, Easter, Thanksgiving and Valentines Day. Other themes range from holiday decorations to celebrations of many favorite animated characters such as Betty Boop, Snoopy, Raggedy Ann and Tweety Bird. I’ve also seen teddy bears, elephants, owls and baseball players. Online examples of 70s style smiley faces and graphic lettering decorations such as “Love” and “Smile” can be found. There were nearly 200 different designs produced. These once-kitschy decorations are now viewed as vintage collectibles by many and can be found on online auction sites like Ebay and Etsy. These were found in an antique store in Fort Myers, Florida.